No need to squeeze in - this one has plenty of room for two! Featuring exceptionally deep foam cushions and a solid wood frame that will see out the decades with beauty and strength, the Mission Morris Loveseat makes the perfect place for enjoying time with friends, family, or simply with the sound of one's own thoughts. Distinctive Mission style flourishes and your choice of hand-cut upholstery give this design the stand-out quality and style that it needs to bring a true sense of everyday luxury to the heart of the family home. Customizable upholstery allows for an infinite set of different looks and feels for the Mission Morris. The Mission Morris is designed to offer ideal comfort in any situation. Whether you're relaxing with a movie and a loved one or simply taking in a book or crafting project with the company of your own thoughts, the Mission Morris's exceptional cushions and ideally angled reclining positions come together to bring hours of support for every part of the day. The solid wood arms are hand-sanded to a perfectly smooth finish to ensure they can offer optimum comfort at any angle, bringing this comfort-first design to a close and ensuring its ability to bring decade after decade of enjoyment to any space. The Mission Morris's fully-finished back allows it to shine in any room. Your Mission Morris Reclining Loveseat will be handcrafted to order, meaning the dedicated woodworkers who craft your piece will be ideally positioned to adjust the design to almost any customization you need. Whether that means new dimensions, different cushions, an upholstery material not listed on our site... whatever it is, we would love to be able to work with our craftsmen to bring every last detail of your vision to life. Please don't hesitate to reach out by phone or by email at any time if you'd like us to start working on a custom Mission Morris. Simply select your perfect wood, stain, and fabric or leather from the menus above to get your order started. 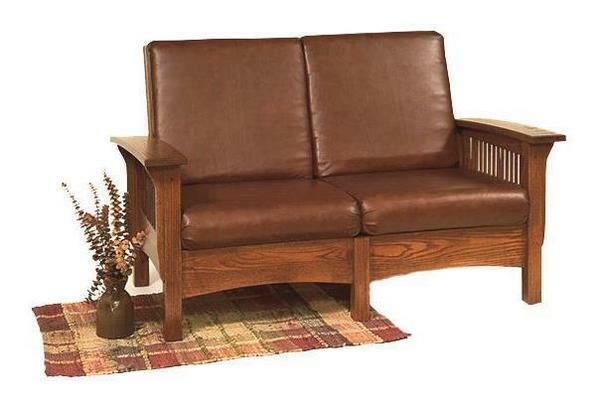 Every single element of your loveseat will be handcrafted to order by dedicated Amish woodworkers with decades of experience behind them, promising you nothing but the best in home-grown quality and care. If you have any questions at all - or if you would like to see free samples of any of our woods, stains, or fabrics and leathers - please don't hesitate to reach out to our team by phone or by email at any time. Note: Customer can provide own fabric or leather. Call for more information. 5 yards of fabric or leather is needed. Cushions are removable and reversible.